When I actually stir myself to gather my thoughts and outline one of the ideas that occasionally flits through my head, I can still manage to come up with some decent direction for something to write about. At first I thought this would be a solid single post, but by the time I finished outlining it I realized we're in for another small series. At least that'll give you something to look forward to, right? 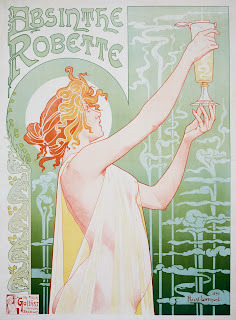 As those of you who keep in touch or are connected with me on the Google+ are likely aware, my latent interest in absinthe has lately blossomed into full-fledged devotion. As I learned more about the enigmatic aperitif, I naturally grew more deeply fascinated with the ritualistic behaviors associated with its preparation, and with the figure of the Green Fairy herself, embodiment of all the mystique of the drink and the culture surrounding it. In absinthe's heyday, enemies of the Green Fairy promoted the notion of absinthism, an addiction distinct in severity and symptoms from common alcoholism. Of course, the scientific evidence adduced to prove the existence of this condition was flawed and insubstantial, and despite its infamy absinthe is in fact no more (or less) capable of harm than any other libation. However, as a modern absintheur I think it appealing and apropos to reclaim the term 'absinthism' for the peculiar fascination, devotion, and adoration that distinguishes absinthe connoisseurship. Perhaps you can see already where this led me. This and the posts that follow will respond to the question: If absinthism were a religion, what would it be? As usual, my primary theoretical guidance in addressing this question and framing some of the possible characteristics of this hypothetical absinthe religion will come from my favorite theory and method scholar, Roy Rappaport. Of course, others may make cameo appearances, but we'll proceed by outlining the cult of the Green Fairy according to Rappaport's hierarchy. Indeed it might be best to call it just a cult, rather than a full-fledged religion. There's more than enough in devotion to the mystique of absinthe personified as the Green Fairy to constitute an idol cult, but quite a few gaps between that and a religious idea system capable of standing on its own. My aim here is to fill in some of those gaps with my own suggestions for how such a larger system could develop (or be deliberately crafted) from the smaller cult, both for the sake of entertainment and to illustrate how a whole religion can grow like a pearl from some small mite itself hardly of any account. Though I tend to agree with my teacher that it's likely cosmological axioms (Rappaport's second tier) precede the enunciation of ultimate sacred postulates (which sit atop his hierarchical model of the structure of religious idea systems), we shall nevertheless start at the top. What are the chief ideas or truths, themselves beyond assault from reason, that could inform a religious absinthism? Extrapolating from the qualities associated with absinthe itself, they should be mystic, creative, or revelatory in character. Rappaport says ultimate sacred postulates are that which imparts sacrality (which, recall, in his particular usage is a quality of unquestionable authority growing from immunity to logical disproof), but perhaps in this case that process of development could be reversed. If the absinthe is sacred (along the lines our other old friend Durkheim means it, essentially that the sacred is set apart), it might suffice as the source of its own sacrality. Absinthe is easy enough to regard as sacred for its remarkable and wonderful physical characteristics, the long history of its ingredient artemesia absinthium as a medicine, and of course its somewhat nefarious reputation as a hallucinogenic potion (false) and inspirational elixir (true). Without too much bandying about the distinction between sacredness and sacrality, we can recognize absinthe may almost be able to stand on its own as an ultimate wellspring of sacrality. ALL HAIL THE GREEN FAIRY. The crucial element that makes the Green Fairy an adaptively strong ultimate sacred object is her flexibility. For minor deities to survive, they have to offer adherents either something really essential (protection from evil, good harvest, strength in fight, success in love, &c.) or be able to diversify. The Green Fairy might be able to get by specializing in inspiration, like the Muses of Helikon, but given her context her chances are much better if she branches out. Certainly absinthe's purported ability to inspire creativity (real, imagined, or perhaps most likely imagined into reality) secures for the Green Fairy her muse-like occupation for artists especially. She could also play a goddess of fortune, at least as a small-time spirit of luck. Anyone who's made the mistake of drinking absinthe neat (an impropriety toward the goddess and something generally untoward besides) probably has been acquainted with her wrathful aspect. The meditation of performing the absinthe ritual (to be addressed in the third installment of this discussion) and the sacrament of partaking of the jade-like distillation also puts her in a blessing or purifying role, or makes her an initiator into an ineffable mystery. Once more, the point is her many possible aspects make the Green Fairy quite adaptively capable. Able to be many things to many believers, she ensures her survival in one mode or another until her cult grows to such a scale that she can afford to specialize, or simply until her multiplicity stabilizes. In any case, her adaptive flexibility means a chance to hold on until a critical mass of worshippers provide the energy for her cult to take on the proportions of an established religious tradition.